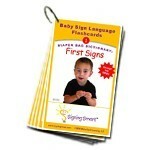 Designed for families looking for a simple, fun, and successful way to begin (or continue) signing with their hearing baby or toddler. The book is a hands-on guide with step-by-step instructions on how to get started signing, how to make signing a natural part of your everyday interactions with your child, and how to use signs to build intimacy and self-esteem. Through our strategy-based and research-proven method, you and your child can be having conversations you thought were months away, without you needing to learn a great many signs, and without you needing to sign every time you say the word! 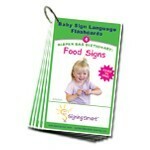 Signing Smart for Early Communication is also a developmental tool to help you understand the path children take in using signs and in learning to talk. 1. 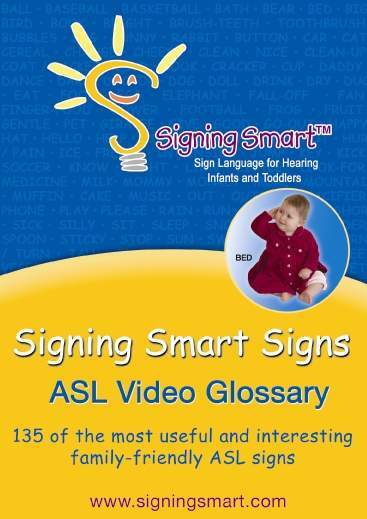 The Signing Smart dictionary: an easy-to-use resource developed for the novice signer, with more than 100 adult photos and descriptions of family-friendly ASL signs. As an added bonus, the dictionary contains photos of babies and toddlers signing, so parents can see what children?s versions of any given sign might be! 2. 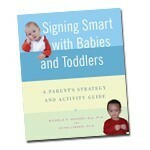 Descriptions of the Signing Smart Start and the Four Keys to Signing Smart Success. More than a list of suggested signs or directions to sign consistently, we have developed a research proven step-by-step plan that will allow you to have fun learning to sign along with your child! 3. 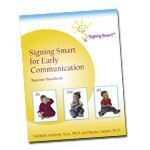 Signing Smart Strategies that teach parents how to use signs so that children have access to them (even if children never look directly at their parents), allowing parents to easily bring signs into their child's world of play and interaction. 4. Signing Smart techniques to allow you to sign less often, but more powerfully! 5. Information about child development that helps parents understand the linguistic and cognitive milestones they are likely to see in their children.